A lawn is an area of recreational or amenity land planted with grass, and sometimes clover and other plants, which are maintained at a low, even height. Lawns are a standard feature of ornamental private and public gardens and landscapes in much of the world today. Lawns are created for aesthetic use in gardens, and for recreational use, including sports. They are typically planted near homes, often as part of gardens, and are also used in other ornamental landscapes and gardens. Lawns are frequently a feature of public parks and other spaces. They form the playing surface for many outdoor sports, reducing erosion and dust as well as providing a cushion for players in sports such as football, cricket, baseball, golf, tennis and bocce. In sports venues, the word lawn is often replaced by turf or green. Many different species of grass are used, often depending on the intended use of the lawn, with vigorous, coarse grasses used where active sports are played, and much finer, softer grasses on ornamental lawns, and partly on climate, with different grasses adapted to oceanic climates with cool summers, and tropical and continental climates with hot summers. It is also not uncommon to mix grass seeds. A 50/50 mixture of grass types can, for example, form a stronger lawn when one grass type does better in the warmer seasons and the other is more resistant to colder weather. There are thousands of varieties of lawngrass, each adapted to specific conditions of precipitation, temperature, and sun/shade tolerance. Breeders are constantly creating new and improved varieties of the base list of lawngrass species. The two basic categories are cool season grasses and warm season grasses. Cool season grasses start growth at 5 °C, and grow at their fastest rate when temperatures are between 10-25 °C (Huxley 1992), in climates that have relatively mild/cool summers, with two periods of rapid growth in the spring and fall. They retain their colour well in extreme cold and typicaly grow very dense, carpetlike lawns with relatively little thatch. Warm season grasses only start growth at temperatures above 10 °C, and grow fastest when temperatures are between 25 °C and 35 °C, with one long growth period over the spring and summer (Huxley 1992). They often go dormant in cooler months, turning shades of tan or brown. Many warm season grasses are quite drought tolerant, and can handle very high summer temperatures, although temperatures below -15 °C can kill most warm season grasses. Lawns cover a significant area in the United States. In a recent NASA-sponsored study, researcher Christina Milesi estimated the area covered by lawns to be about 128,000 square kilometers (nearly 32 million acres) making it the largest irrigated crop in the United States, about three times that of irrigated corn. Lawn care is thus a major business in America. Maintenance, construction and management of lawns of various kinds are the focus of much of the modern horticulture industry. Estimates of the amount spent on professional lawn care services vary, but a Harris Survey put the total at $28.9 billion in 2002, which averages to around $1,200 per household, spread over the 24.7 million households who use such services. American front lawns are a symbol of man's control of, or superiority over, his environment. Approximately 50-70 percent of U.S. residential water is used for landscaping, most of it to water lawns. Air and surface cooling to offset asphalt, cement, and rooftops. In comparison to bare dirt, a lawn may be 20 degrees cooler on a hot day, and up to 40 degrees cooler than cement surfaces. 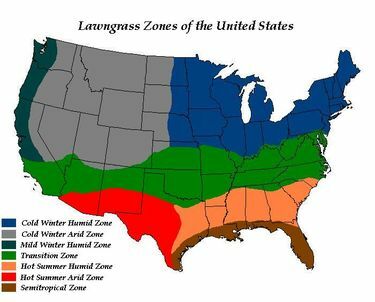 Lawn Grass Zones of the U.S.
Before the invention of mowing machines in 1830, lawns were managed differently from today. Lawns belonging to wealthy people were sometimes maintained by the labour-intensive methods of scything and shearing. In most cases however, they were pasture land, maintained by grazing with sheep or other livestock. Areas of grass grazed regularly by rabbits, horses or sheep over a long period can form a very low, tight sward which is similar to a modern lawn. This was the original meaning of the word "lawn", and the term can still be found in place-names. Some forest areas where extensive grazing is practiced still have these semi-natural lawns. For example, in the New Forest, England, such grazed areas still occur commonly and are still called lawns, for example Balmer Lawn. Lawns became popular in Europe from the Middle Ages onward. The early lawns were not always distinguishable from pasture fields. It is thought that the associations with pasture and the biblical connotations of this word made them attractive culturally. By contrast, they are little known or used in this form in other traditions of gardening. In addition, the damp climate of maritime Western Europe made them easier to grow and manage than in other lands. Lawns were also used in medieval times within monasteries and in the courtyards of castles for the lords and ladies to take their daily constitutional and escape from the odours of the castle. It was not until the Tudor and Elizabethan times that the garden and the lawn became a place to be loved and admired. Created as walkways and for play areas, the lawns were not as we envisage them today. They were made up of meadow plants, such as camomile, a particular favourite. In the early 1600s, the Jacobean epoch of gardening began. It was during this period that the closely cut "English" lawn was born. By the end of this period, the English lawn was the envy of even the French. It was also seen as a symbol of status by the gentry. In the early 1700s, gardening fashion went through a further change. William Kent and the age of Capability Brown were in progress, and the open "English" style of parkland was seen across Britain and Ireland. Lawns seemed to flow from the garden into the outer landscape. During Victorian times, as more plants were introduced into Britain, and the influence of France and Italy became prevalent, lawns became smaller as borders were created and filled with plants, statues, sculptures, terraces and water features, which started eating into the area covered by the lawn. In the United States, it was not until after the Civil War that lawns began to appear in middle class residences. Most people did not have the hired labor needed to cut a field of grass with scythes. Average home owners either raised vegetables in their yards or left them alone. If weeds sprouted that was fine. Toward the end of the 19th century, suburbs appeared on the American scene, along with the sprinkler, greatly improved lawn mowers, new ideas about landscaping and a shorter work week. Maintaining a rough lawn requires only occasional cutting with a suitable machine, or grazing by animals. Seasonal lawn care will vary to some extent depending on the climate zone and type of grass that is grown, whether cool season or warm season varieties. In general, however, there are recognized steps in lawn care that should be observed in any of these areas. 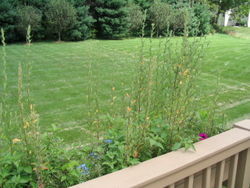 Spring or early summer is the time to seed, sod, or sprig your yard, when the ground is warmer. For a new lawn, it’s a good idea to add a fresh load of topsoil to the ground. Seeding the lawn is the least expensive way to plant, but it takes longer for the lawn to grow. Sodding is more expensive, but it will give you an almost instant lawn that can be planted in most climate zones in any season. 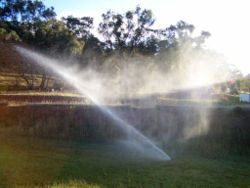 Hydroseeding is a relatively quick and inexpensive method of planting. A nitrogen-based, slow-release fertilizer should be applied as well as a weed killer and a product for lawn pest removal. 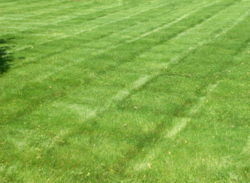 Summer lawn care requires raising the lawn mower if you have cool season grass and lowering it for warm season lawns. Lawns will require longer and more frequent watering, best done in early morning to encourage a stronger root system. This is also time to apply an all-purpose product such as Munns Golf Course Green Organic fertilizer. During the hot summer months, lawns may be susceptible to fungus disease. It’s advisable to take a sample to your local landscape expert for testing and treating your yard, if necessary. In the fall, lawns can be mowed at a lower height and thatch buildup that occurs in warm season grasses should be removed, although lawn experts are divided in their opinions on this. This is also a good time to add a sandy loam and apply fertilizer such as Munns Greenup, one that contains some type of wetting agent. Cool season lawns can be planted in autumn if there is adequate rainfall. Lawn care in winter is minimal, requiring only light feedings of organic material, such as green-waste compost, and minerals to encourage earthworms and beneficial microbes. Nitrogen-based fertilizers should not be applied during the months from November to March, because they will stimulate unwanted growth and contribute to disease and other lawn problems in the spring. Many lawns are composed of a single species of plant, or of very few species, which reduces biodiversity, especially if the lawn covers a large area. In addition, they may be composed primarily of plants not local to the area, which can further decrease local biodiversity. Lawns are sometimes cared for by using pesticides and other chemicals, which can be harmful to the environment if misused. Maintaining a green lawn often requires large amounts of water. This was not a problem in temperate England where the concept of the lawn originated, as natural rainfall was sufficient to maintain a lawn's health. However the exporting of the lawn ideal to more arid regions of the world, such as the U.S. Southwest, has crimped already scarce water resources in such areas, requiring larger, more environmentally invasive water supply systems. Grass typically goes dormant during cold, winter months, and turns brown during hot, dry summer months, thereby reducing its demand for water. Many property owners consider this "dead" appearance unacceptable and therefore increase watering during the summer months. Grass can also recover quite well from a drought. In the United States lawn heights are generally maintained by gasoline powered lawnmowers, which contribute to urban smog during the summer months. The U.S. Environmental Protection Agency found that in some urban areas, up to 5% of smog was due to pre-1997 small gasoline engines such as are typically used on lawnmowers. Since 1997, the EPA has mandated emissions controls on newer engines in an effort to reduce smog. Lawns use up vast areas of arable land that might otherwise be used for growing crops. However, using ecological techniques, the impact of lawns can sometimes be reduced. Such methods include the use of local grasses, proper mowing techniques, leaving grass clippings in place, integrated pest management, organic fertilizers, and introducing a variety of plants to the lawn. One positive benefit of a healthy lawn is that of a filter for contaminants and to prevent run-off and erosion of bare dirt. Highway construction projects in the United States now routinely include replanting grasses on disturbed soils for this purpose, although they are not maintained as lawns.